DNP Laminate Media - ACE Peripherals ::: Completing I.T. 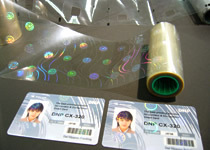 Based on the customer's requirement, we are able to offer various types of lamination media. There are mainly 2 types of media, one is patch film and the other is overlay foil. Patch film is a 1.0 mil or 0.6 mil polyester film and it gives more durability on the card. The hologram effect can also be added in patch film. Since it does not cover the whole surface of the card, there is about 2mm space around the card. For covering whole surface of the card, overlay foil would be a better choice. Because foil does not adhere onto the chip area, there is no need to prepare two types of overlay foil for normal card and chip card. In summary, the overlay foil gives more security on the card. However, it does not have much durability compared to the patch film. ※Custom design hologram patch/overlay is available.